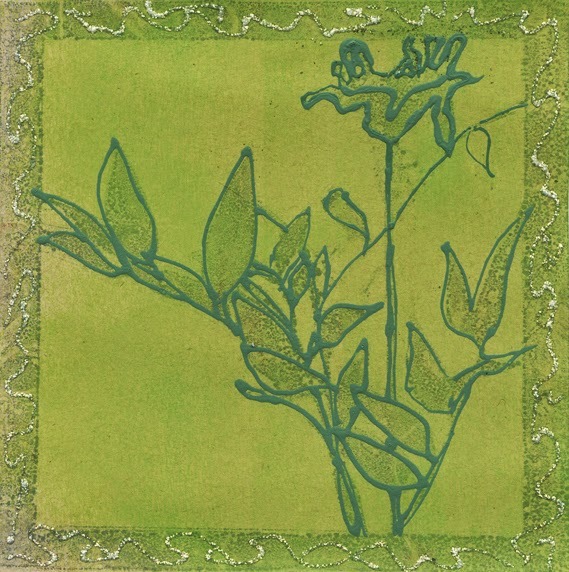 Backgrounds for art journal pages can be simple or multi-layered, as the mood strikes. This technique keeps all options open. 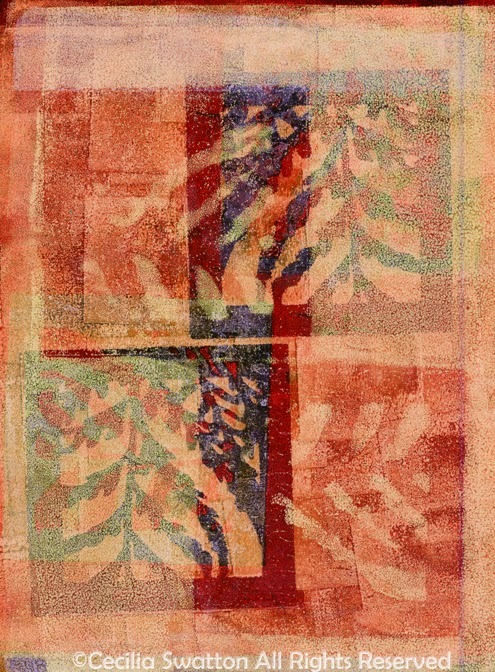 The first part of this process creates realistic prints, but if you continue with a second (or third or fourth) series of prints, abstract patterns emerge. 1. Put down a paper matching the size of the stencil, then set the Plexiglas over it. Here I'm using 6"X6" light-brown cardstock as my guide-paper. 2. 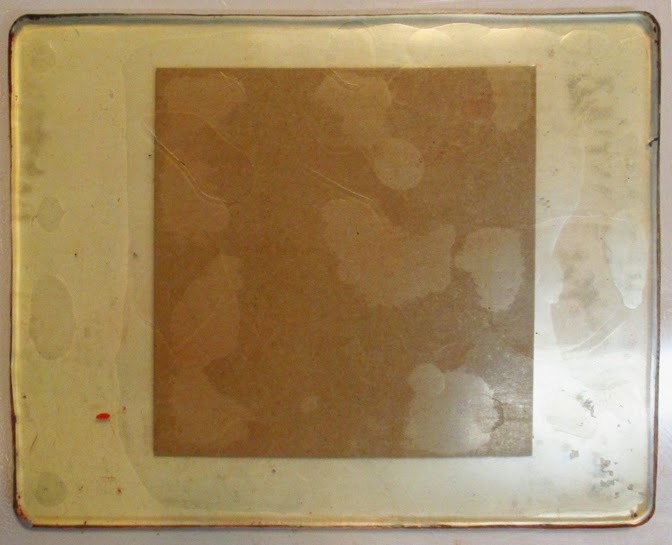 Place your Gelli Plate onto the Plexiglas, directly above that guide-paper. 3. 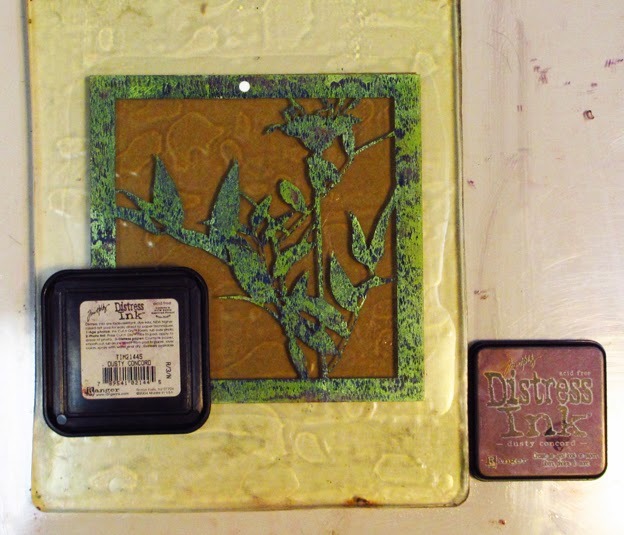 Place the stencil onto the Gelli Plate, lining it up with the guide-paper under the Plexi. 5. 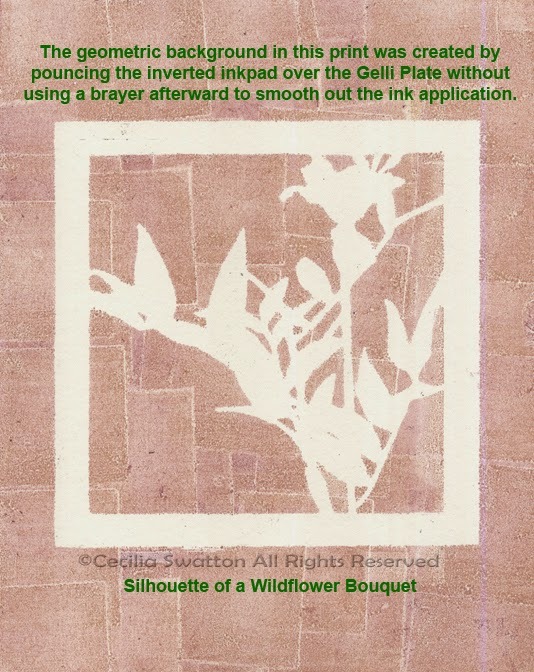 Lift off the inkpad lid, turn the inkpad upside down, and pounce the ink across the Gelli Plate. It will look as if very little ink is there -- but looks are deceiving. 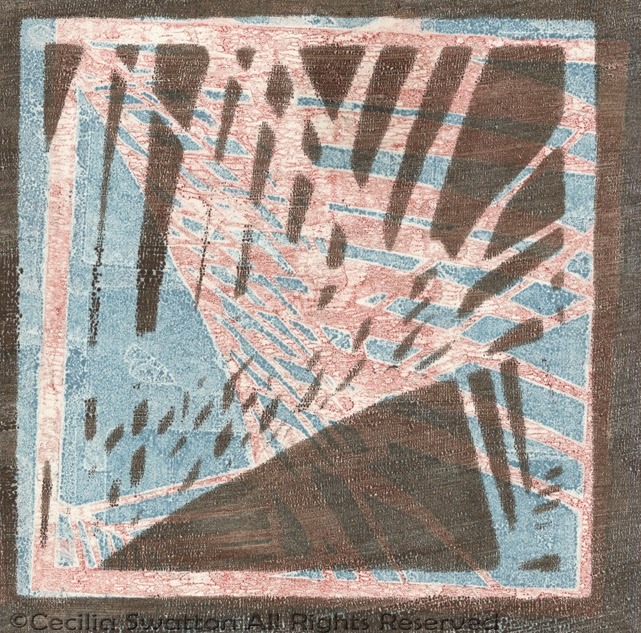 and another final print created without the brayer. 6. Lift off the stencil and set it aside. Clean the stencils after finishing for the day. Distress Ink will dry quickly on non-glossy paper but, being oil-based, it will never dry on plastic stencils. 7. 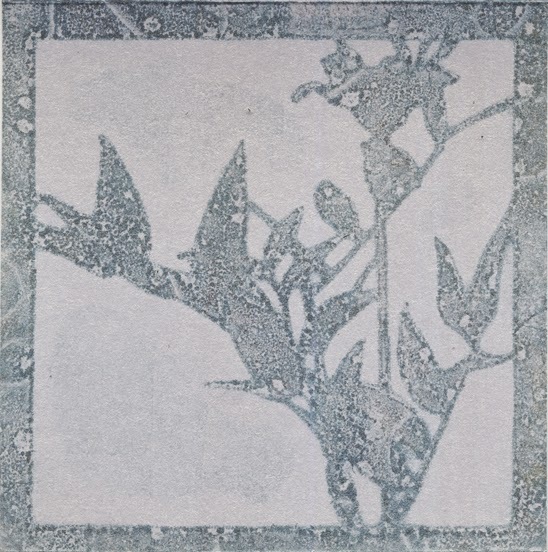 Lay down a sheet of printing paper, using the paper under the Plexiglas as a guide. With a Sharpie pen, dot the top of the back of the paper to be printed. 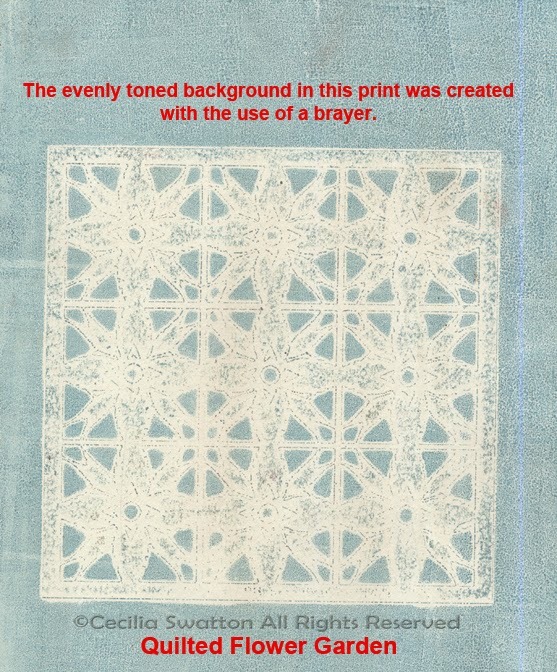 This will show which side of the pulled print is the "top," to correspond with the top-side dotted stencil. 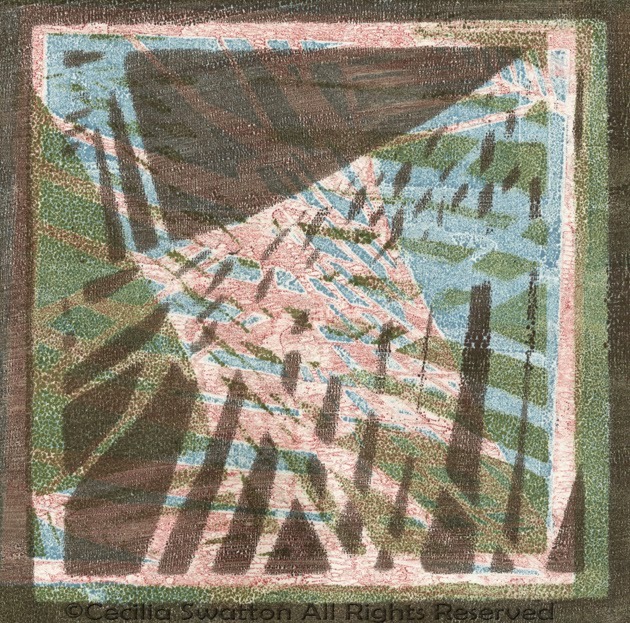 After pulling all the prints you want, clean the Gelli Plate.You now have realistic-looking prints -- but if you want abstract images, the time has come to pull more prints, using the same sheets just printed. 8. 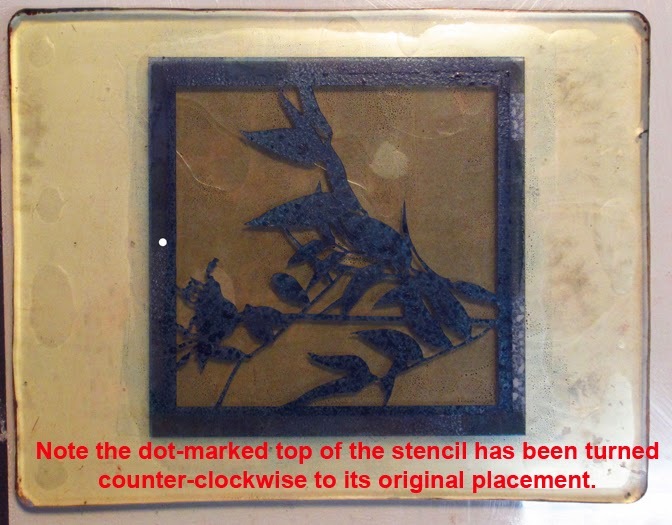 Start this phase of the project by placing the stencil on the Gelli Plate, turned it so that the dot-marked side (the "top") is facing a different direction -- it can be upside down, or turned 90 degrees to the left, or to the right. The goal is to have the design facing a different direction from its original placement. Here I have turned a stencil counter-clockwise from its original position. 9. Again, apply ink with an inverted Distress Inkpad. This time, use a color that contrasts with the color of the first print. 10. Lift off the stencil. 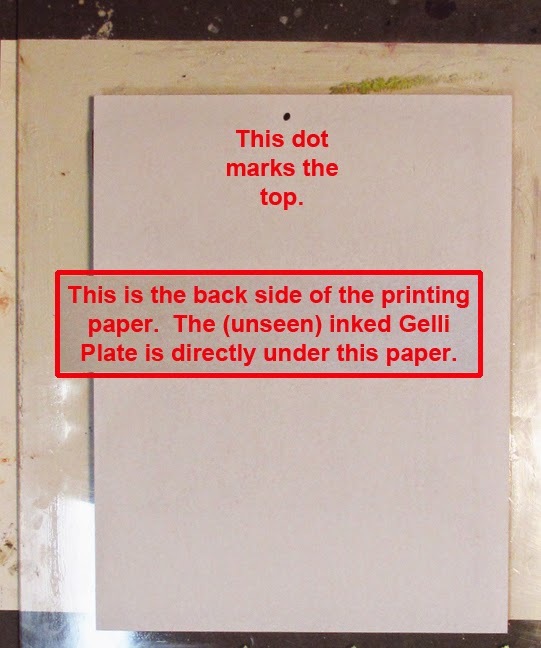 Then place the dotted printing paper onto the plate with its dot still facing the original "top" direction. Pull the print -- and you'll find you've printed the second print atop the original print, but with the two imprinted designs facing different directions, in contrasting colors. 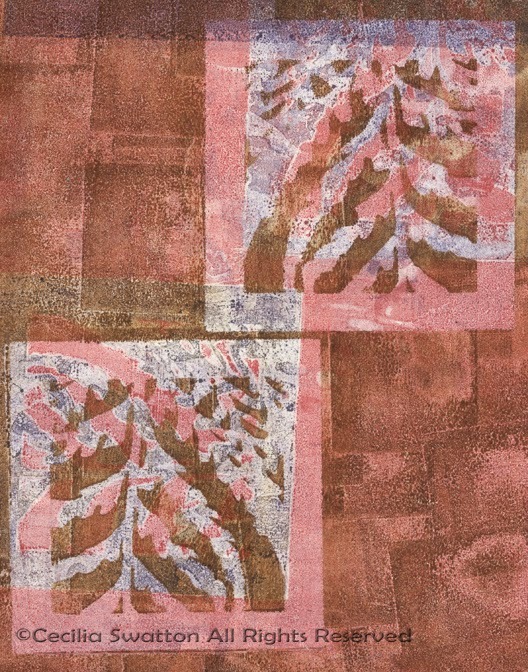 The result is a variety of abstract images. register. Here is an example. Note the difference between The off-register print above and one below that is on register. The dots that make registration possible are just as useful when you want to purposely make off-register prints. Some artists may prefer on-register prints -- but I think variety is the spice of life. The above steps can be repeated endless times, layering any number of ink colors. With each color change, continue rotating the stencil. 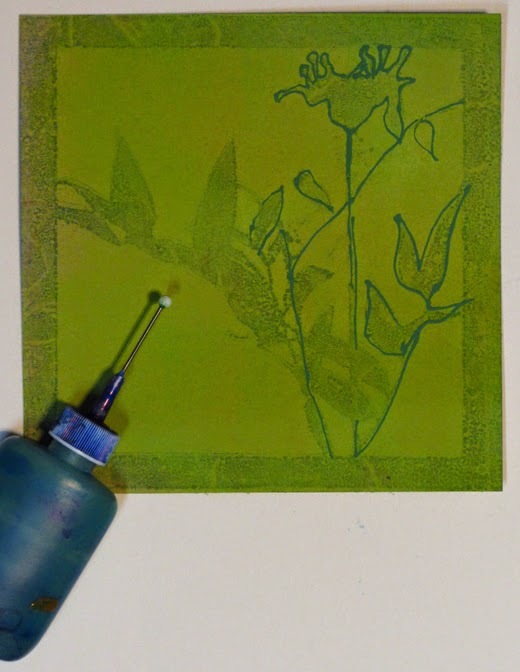 Or you can keep it simple, using your first set of prints just as they came out, without adding more layers. 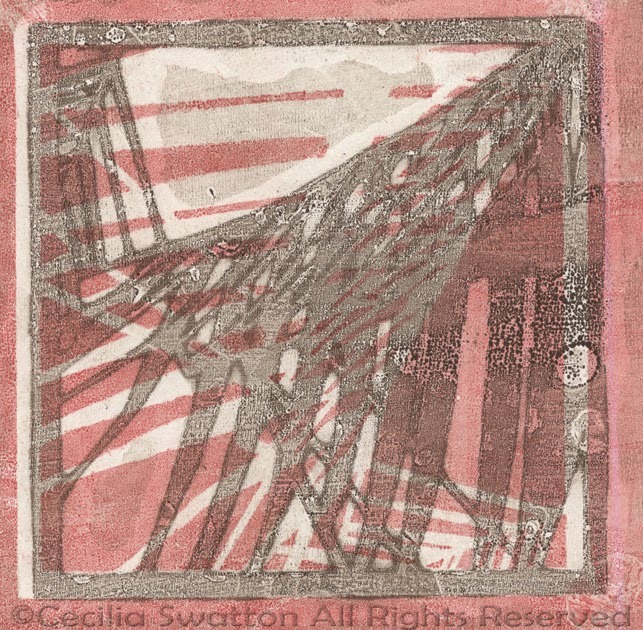 Here's one example of an original print. Another option is to paint one or more layers of translucent acrylic paints over Distress ink prints. Distress inks dry quickly on non-glossy paper and then will readily accept topcoats of acrylic paint -- as shown here. Yet another option is to outline one of the single-print images with a Sharpie pen, a color pencil -- or acrylic paint, as I've done here. I used a fine point applicator from Cheap Joe Art Supplies. ways all my own, but the original idea came from Barbara. 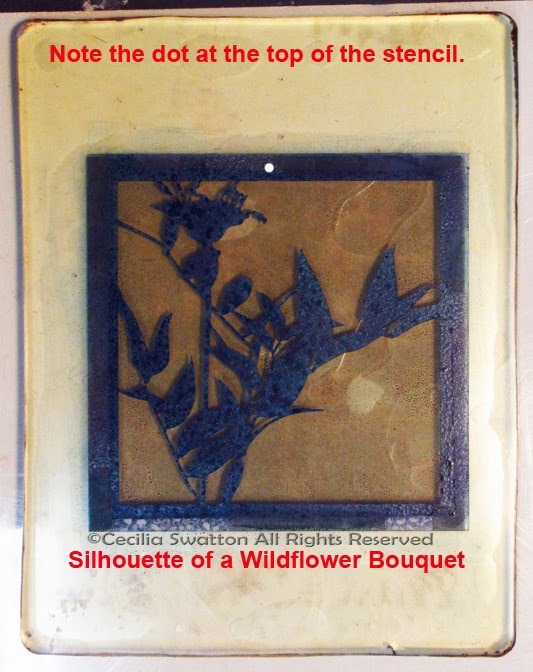 StencilGirl stencils: Palm Fronds Silhouette Small, Palm Fronds Silhouette Mini, Fern Fronds Silhouette, Silhouette of a Wildflower Bouquet and Quilted Flower Garden. 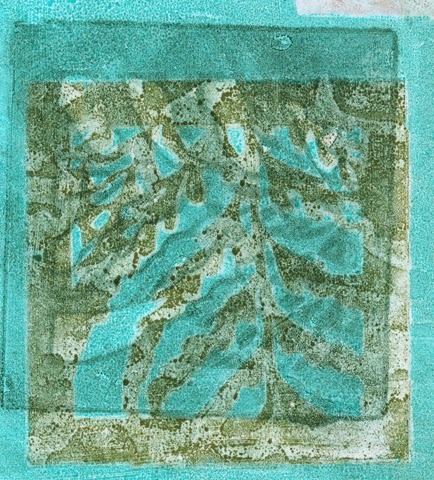 Gelli Printing Plate (Note: Here I'm using the 8" x 10" Gelli Plate. 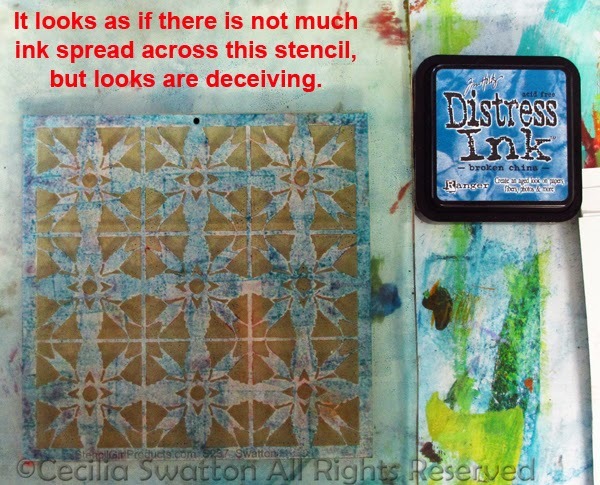 If you happen to have the 6" x 6" Gelli Plate (which perfectly fits 6" x 6" stencils from StencilGirl) you can skip Step 1 if using only 6"x 6" stencils in this technique. 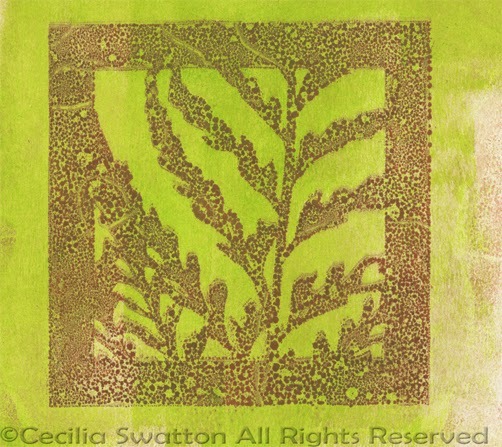 However, if you have the 6"x 6" Gelli Plate and plan to use 4" x 4" stencils, as I am here, it's best to include Step 1. Thanks so much...this post is so helpful. Cecilia, this post is so cool. I love how your prints came out. The outlined one is really nice. Thank you for sharing. Have you tried any other ink pads? No, I haven't tried other inkpads. I think it may be important that Distress inkpads are oil-based ... for this reason I would recommend sticking to inkpads that are likewise oil-based. Another commenter -- thank you for your kind words, Cindy -- asked me about using Distress re-inkers. I would be careful using them because they might flood the Gelli with too much liquid. It's amazing how little liquid is needed. Cecilia! Thank you so much for the step by step and all the hints! Your prints are amazing and beautiful! I love the subdued effects-gorgeous!